Collaboration is the name of the game..
After an incredible opening ceremony and party for the first English school in the Mentawais, the week continued with another first, our collaboration with the brilliant non-profit wavesforwater.org, bringing clear drinking water to those in need around the globe. In the village of Mapadegat where we are based many locals boil well water they collect to drink. This is time consuming as you must collect fire wood if they have no gas, unhealthy as boiling does not always kill harmful bacteria and the house is filled with smoke, you must wait for water to cool and accidents with young children and hot water occur. 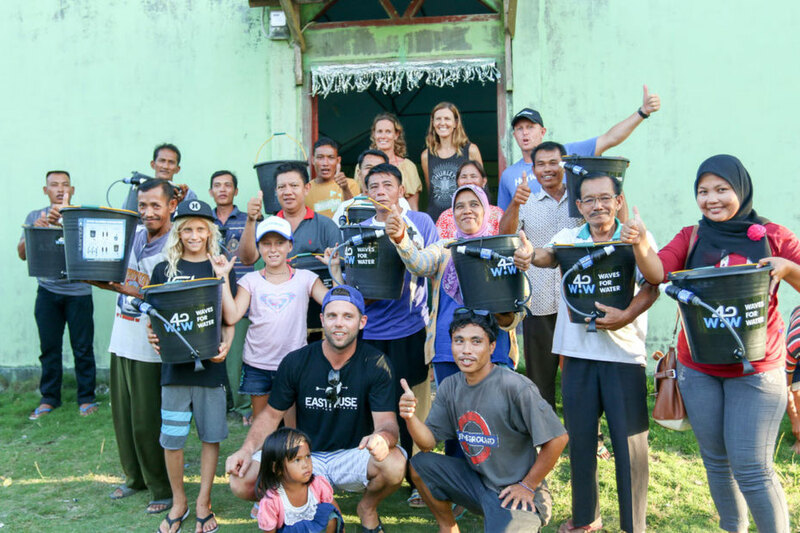 Now 15 families in the area are using the cutting edge water filters provided by Waves For Water after receiving a training session during their visit. Our local co-ordinator Un checked in with the families to help with any questions they have and to see how they were getting on. Great news. All the families are happily using them and enjoying the extra time they now have in addition to having clean, safe drinking water. Thanks so much Waves For Water team! Being permanently based in the Mentawais allows A Liquid Future to offer invaluable support to outside organisations wishing to implement projects here. It is a role we relish and are thrilled to be able to carry out. Acting as an “on the ground facilitator” we provide the link to the local communities and have up-to-date information and contacts outside organisations need. We will continue our collaboration with Waves For Water training local teachers from surrounding villages to use the filters in schools and acting as the “Point of Contact” for further implementations in their respective villages brining clean drinking water to more people.